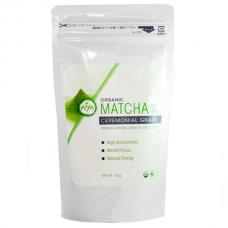 Organic Matcha Ceremonial Grade 100 gram. Organic matcha of this high quality is quite rare. Aiya’s Organic Ceremonial Matcha has more than 30 years of organic cultivation expertise behind it. Each 100g (3.5oz) bag is good for approximately 50 servings.